Bochsler D. Duverger and the Territory: Explaining Deviations from the Two‐Party‐ Competition‐Law. In: Grofman B, Dolez B, Laurent A, editors. Duverger’s Law and Beyond: Duverger’s Law at 65. Springer; 2019. Bochsler D. Electoral Systems in the Making. In: Congleton R, Grofman B, Voigt S, editors. Oxford Handbook of Public Choice. Oxford University Press; 2019. Bochsler D, Hänni M. The three stages of the anti‐incumbency vote: retrospective economic voting in young and established democracies. European Journal of Political Research. 2019;58(1):30-55. Bochsler D. Bottom‐up renewal of the Swiss party system. Regional and Federal Studies. 2018. The Swiss party system and the institutional rules guiding elections are an anchor of stability in Swiss politics. This article investigates recent change in cantonal elections, and analyses how electoral swings in cantonal elections diffuse to other cantons, and whether they predict future electoral swings in the national electoral arena. Empirically, the article combines a statistical analysis of electoral results from the period 1990–2017 in cantonal and national elections with a qualitative discussion of the period from 2014 to 2017. Bochsler D. Lo stemperamento dei contorni politici dei Cantoni svizzeri. In: Mueller S, Giudici A, editors. Il federalismo svizzero. Attori, strutture e processi. Dadò, Locarno; 2017. p. 63-91. Bochsler D. “The strategic effect of the plurality vote at the district level. Electoral Studies. 2017;47:94-112. The plurality vote (first-past-the-post) is one of the most restrictive electoral systems used for parliamentary elections. Empirically, its deterring effect on small political parties has been widely studied at the national level, while theoretical arguments highlight its strategic effect at the district level. This paper argues that the strategic effect, reducing the votes expressed for minor parties in plurality vote systems, is uneven across districts. The strongest strategic effect is expected in very competitive constituencies, where the two strongest candidates are in close competition with each other. The paper estimates the effect empirically, based on electoral results for minor political parties from six parliamentary democracies using the plurality vote. The methodology proposed in this paper allows me to separate sociological or geographical factors from strategic factors affecting party support. Results show that due to the strategic effect, minor parties lose some 15% of their votes in very competitive districts. Bochsler D, Hänni M. What Democracy Do We Want? The Problematic Focus on the Median Voter. Swiss Political Science Review. 2017;23(3):270-8. Bochsler D, Schläpfer B. An Indirect Approach to Map Ethnic Identities in Post‐conflict Societies. Ethnopolitics. 2016;15(5):467-86. Ethnicity remains one of the most salient layers of individuals’ social identities, and information about the distribution of ethnic identities turns out to be crucial for many studies that investigate political or social processes in divided societies. In the aftermath of civil wars, however, censuses providing such data are controversial and often delayed. Where census data is lacking, researchers can make use of the multiplier method to infer the distribution of ethnic identities based on indirect observations from sub-samples of the population. However, due to the selective nature of their data, the sub-samples might not be representative of the population. This paper proposes a method, which corrects for such selection effects. Based on the ethnic identity of birth-giving parents, we estimate the distribution of ethnic identities in the municipalities of the Federation of Bosnia and Herzegovina for 2008-10. We correct for possible selection biases by including economic, demographic and war related variables. Multiple tests of validity show that our estimation appears to be the most accurate procedure currently available for the distribution of ethnic identities in municipalities in Bosnia and Herzegovina. Bochsler D, Schläpfer B. The normative trap in ethnopolitical research. Ethnopolitics. 2016;15(5):493-6. Bochsler D, Gerber M, Zumbach D. The 2015 National Elections in Switzerland: Renewed Polarization and Shift to the Right. Regional and Federal Studies. 2016;26(1):95-106. The 2015 election to the Swiss Parliament marks a return to an already observed trend that was only interrupted in 2011: a shift to the right and an increase in polarization. The vote share of the nationalist-conservative Swiss People's Party (SVP) has now reached a historical height of 29.4% (+2.8). This note discusses why cantons matter in the Swiss national elections, and to what degree elections have become nationalized. Institutionally, the 26 cantons serve as electoral districts. This leads to a highly disproportional electoral system and has magnified the minor vote shifts to a slightly more pronounced shift in seats, with the right now holding a tiny majority of 101 of 200 seats in the first chamber. The two winners, the SVP and the Liberals, also had most campaign funds at their disposal. They were able to guide an extensive nationwide campaign in which they advocated their core issues instead of candidates. Other parties only advertised at the cantonal level. Bochsler D, Mueller S, Bernauer J. An Ever Closer Union? The Nationalisation of Political Parties in Switzerland, 1991‐2015. Swiss Political Science Review. 2016;22(1):29-40. The contribution of this research note is a systematic description of levels of party nationalisation in Switzerland, using results from the elections to the Swiss National Council between 1991 and 2015. Party nationalisation is understood as the territorial homogeneity of a party's electoral performance and measured using the inverted and standardised Gini index. Our results indicate a trend towards more nationalisation in the Swiss party system over the time period covered, and distinct patterns for single parties. The SVP and the GLP have made big leaps towards stronger nationalisation, with the former closing in on the levels of the SP and the FDP, while the CVP remains a weakly nationalised party, considering its size. Bochsler D, Häusermann S, Hänggli R. Consensus Lost? Disenchanted Democracy in Switzerland. Swiss Political Science Review. 2015;21(4). Bochsler D, Bousbah K. Competitive Consensus. What comes after consociationalism in Switzerland? Swiss Political Science Review. 2015;21(4):654-79. Competitive Consensus. What comes after consociationalism in Switzerland? Large coalition governments, including all relevant parties, are at the heart of the consociational model of Swiss democracy. Until the 1990s, this model was characterised as “voluntary proportional”. It was based on a stable cooperation of two main blocs of political parties, and on elite‐driven agreements on all‐inclusive government formulas. Despite growing competition in governmental elections, all‐party coalitions have survived in most cantons. This article explains that the political minority could keep and even improve its representation, as a consequence of the divisions in the political majority. While right‐wing parties hold the majority in almost all Swiss cantons and at the federal level, they are no longer sufficiently cohesive to control the elections. As a consequence, elections have become more uncertain, and political minorities can capitalise on this in order to win seats. Empirically, this paper investigates elections for Swiss cantonal governments in the period 1971–2011. It combines data on the unity of political blocs with data on government formation. To measure the political unity of the blocs, the paper introduces a novel measure based on the voting recommendations issued by cantonal parties on the occasion of national referendums. Bochsler D, Häusermann S, Hänggli R. Consensus Lost? Disenchanted Democracy in Switzerland. Swiss Political Science Review. 2015;21(4):475-90. Bochsler D, Hug S. How minorities fare under referendums. A cross‐national study. Electoral Studies. 2015;(38):206-16. Bochsler D, Bernauer J. “Strategic Incentives in Unconventional Electoral Systems. Representation. 2014;50(1). The study of strategic behaviour and the impact of institutions on elections has mainly focused on simple and conventional electoral systems: list-proportional electoral systems (PR) and the plurality vote. Less conventional systems are not on the agenda of comparative studies, even though no less than 30% of countries use unconventional electoral systems for their national parliamentary elections, such as the Single Transferable Vote, PR with majority bonuses, or mixed electoral systems. Often, they provide for unusual combinations of different institutional incentives, and hence to particular actor strategies. Bochsler D, Leemann L. A systematic approach to electoral fraud. Electoral Studies. 2014;(35):33-47. Bochsler D. Which mixed‐member proportional electoral formula fits you best? Assessing the proportionality principle of positive vote transfer systems. Representation. 2014;50(1):113-27. Mixed-member proportional systems (MMP) are a family of electoral systems which combine district-based elections with a proportional seat allocation. Positive vote transfer systems belong to this family. This article explains why they might be better than their siblings, and examines under which conditions full proportionality is reached. A formal model shows that full proportionality depends on the number of compensation mandates available, and on the degree of coordination among voters and parties. The model is applied to six elections in Hungary. 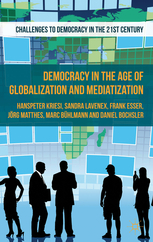 Bochsler D, Kriesi H, Lavenex S, Esser F, Matthes J, Bühlmann M. Democracy in the Age of Globalization and Mediatization. UK: Palgrave Macmillan UK; 2013. Bochsler D, Kriesi H. Entwicklung der Demokratie. Ein langer Weg. In: Democracy NCCR, Kriesi H, Müller L, editors. Herausforderung Demokratie. Zurich: Lars Müller Publishers; 2013. p. 15-97. Bochsler D, Kriesi H. Verschiedene Formen der Demokratie. Wie herrscht das Volk? In: Democracy NCCR, Kriesi H, Müller L, editors. Herausforderung Demokratie. Zurich: Lars Müller Publishers; 2013. p. 192-269. Bochsler D, Kriesi H. The Development of Democracy. A Long Road. In: Democracy NCCR, Kriesi H, Müller L, editors. Democracy: An Ongoing Challenge. Zurich: Lars Müller Publishers; 2013. p. 10-97. Bochsler D, Kriesi H. Different Forms of Democracy. How Do the People Rule? In: Democracy NCCR, Kriesi H, Müller L, editors. Democracy: An Ongoing Challenge. Zurich: Lars Müller Publishers; 2013. p. 192-269. Bochsler D, Szöcsik E. On fissions and fusions of ethnic minority parties. In: Iglesias JD, Stojanović N, Weinblum S, editors. New Nation-States and National Minorities. ECPR Press; 2013. p. 233-56. Bochsler D. Radicalizing Electoral System Effects on Support for Nationalist Hardliners in Serbia. Nations and Nationalism. 2013;19(1):21-43. This paper investigates electoral outcomes produced by the two‐round majority system in ethnically divided societies. Earlier studies, focused mainly on the Southern American states, have revealed that in ethnically mixed environments, competitors with radical positions on ethnic issues perform particularly well. This paper extends this idea to municipal elections in Serbia, showing how radical majority nationalist parties exhibit particularly strong performances in ethnically mixed municipalities. While this effect is also apparent under proportional representation, we argue that it is much stronger when a two‐round majority vote system is employed. Schneider CQ, Bochsler D, Chiru M. Comparative Politics in Central and Eastern Europe: Mapping Publications Over the Past Twenty Years. European Political Science. 2013;12(1):127-45. This article offers a new empirical perspective on the state of Comparative Politics (CP) in Central and Eastern Europe (CEE). We present findings on the authors, methods, and epistemology of CP publications in the most relevant journals from eleven countries in the region. The major finding is that CP is rather marginal in CEE Political Science. Furthermore, CP articles predominantly focus on the authors’ country of origin, use off-the-shelf data, apply mostly qualitative data analysis techniques, and rarely take a historical perspective. Bochsler D, Szöcsik E. "Building Inter‐Ethnic Bridges or Promoting Ethno‐Territorial Demarcation Lines? Hungarian Minority Parties in Competition. Nationalities Papers. 2013;41(5):761-79. Parties of ethnic minorities are flourishing in a large number of ethnically divided democracies. While academic research has studied their emergence and success, we know little about intra-group party competition. This paper discusses the reasons for intra-group political plurality, with a focus on intra-party conflict and intra-group party competition: it explains the political orientation of ethnic minority parties and their intra-group challengers as a consequence of the inclusion of minority parties into government. The inclusion of minority parties into national governments produces an inherent conflict between pragmatic office-seekers and radical partisans. In minority parties that have governmental responsibilities, the pragmatist view overwhelms, while in those parties in opposition, radical voices dominate. The formation of two intra-Hungarian challenger parties in Romania and in Slovakia in 2007 and 2009 represents two very similar cases, which appear to be in line with our hypotheses. Schneider CQ, Bochsler D, Chiru M. Comparative Politics in Central and Eastern Europe: Mapping Publications Over the Past 20 Years. European Political Science. 2012:1-19. Bochsler D. When two of the same are needed: A multilevel model of intragroup ethnic party competition. Nationalism and Ethnic Politics. 2012;18(2):216-41. Bochsler D. A quasi‐proportional electoral system 'only for honest men'? The hidden potential for manipulating mixed compensatory electoral system. International Political Science Review. 2012;33(4):401-20. Mixed compensatory systems have risen in popularity in recent years. Under such systems, single-seat districts elect only the leader of the local suffrage, but the systems nevertheless produce (nearly) proportional outcomes overall, via compensatory mandates. Elections in Albania, Italy, Lesotho, and Venezuela, however, demonstrate a particular loophole for such systems: strategic voting, organized by political parties. Large parties can achieve over-representation by encouraging their voters to split their votes. In this way, they outsmart the compensatory mechanism designed to lead to proportional results. These disproportional results are particularly controversial, since they are deliberate and strategic. This article takes the 2005 Albanian elections as its main case study, and uses simulations to illustrate its political consequences. Bochsler D. Minority representation in a semi‐democratic regime: the Georgian case. Democratization. 2012;19(4):611-41. Bochsler D. Non‐discriminatory rules and ethnic representation: the election of the Bosnian state presidency. Ethnopolitics. 2012;11(1):66-84. Bochsler D, Cholova B. From big political change to permanent change of governments. The logic of 20 years of political party competition in Central and Eastern Europe. In: Hayoz N, Jesien L, Koleva D, editors. Twenty Years After the Breakdown of Communism in CEE: Promises, Meanings and Implications of 1989.; 2011. Bochsler D. Let the people decide? Learning from Swiss direct democracy in a comparative perspective. In: Ramel S, Cheneval F, editors. Transitions. Vol 51(1). ; 2011. p. 115-20. Bochsler D, Bernauer J. Electoral Entry and Success of Ethnic Minority Parties in Central and Eastern Europe: A Hierarchical Selection Model. Electoral Studies. 2011;30(4):738-55. The paper examines determinants of electoral entry and success of ethnic minority parties in central and eastern Europe. The application of a hierarchical selection model shows that the strategic entry of minority parties depends on their expected electoral success due both to observed and unobserved factors. Drawing on formal models of electoral entry, the electoral success of new (or niche) parties is expected to be influenced by the costs of entry (determined by electoral thresholds) and the potential for electoral support. The latter depends on the reactions of political competitors and electoral demand, measured here as the size of ethnic groups and the saliency of ethnic issues. In line with these expectations, parties only run if they can expect electoral support sufficient to pass the electoral threshold. This finding would have been overlooked by a naïve model of electoral success which does not take self-selection into account. Bochsler D. It is not how many votes you get, but also where you get them. Territorial determinants and institutional hurdles for the success of ethnic minority parties in post‐communist countries. Acta Politica. 2011;46(3):217-38. Electoral rules have long been held as important for the success of new political parties, but research has neglected the dimension of territory in this equation. This article argues that the territorial structure of social groups, in interaction with the electoral system, makes a crucial difference for the ability of new parties to enter parliament. In district-based electoral systems, social groups that are highly concentrated face much lower hurdles with an own party than groups that are spread throughout the country. The argument is tested on a novel database on ethnic minority groups from post-communist countries in Europe, including 123 minorities in 19 countries. To test hypotheses with complex interaction effects and binary variables, Qualitative Comparative Analysis appears as the most suitable method. After controlling for size and special minority-relevant provisions in the electoral systems, there is strong confirmation for the hypothesised effect. Bochsler D. Territory and Electoral Rules in Post-Communist Democracies (Palgrave monograph, 2010). Houndmills: Palgrave; 2010. Bochsler D. Regional party systems in Serbia. In: Stojarová V, Emerson P, editors. Party politics in the Western Balkans. Routledge; 2010. p. 131-50. Bochsler D. The party system of Serbia. In: Stojarová V, Emerson P, editors. Party politics in the Western Balkans. Routledge; 2010. p. 99-118. Bochsler D. L'union fait la force: les apparentements de listes au sein de la gauche. In: Nicolet S, Sciarini P, editors. La recomposition de la gauche. Analyse du vote PS et Verts en Suisse. Genève: Georg; 2010. p. 361-94. Bochsler D. Komünizm Sonrası Demokrasilerde Seçim Sistemleri ve Etnik Azınlıkların Temsili. In: Erkan E, editor. Seçim Sistemleri ve Etnik Azınlıkların Parlamenter Temsili. Istanbul: Beta Bası; 2010. p. 37-64. Bochsler D. Political parties in Serbia. In: Stojarová V, Emerson P, editors. Party politics in the Western Balkans. Abingdon: Routledge; 2010. p. 99-118. Bochsler D. Regional party systems in Serbia. In: Stojarová V, Emerson P, editors. Party politics in the Western Balkans. Abingdon: Routledge; 2010. p. 131-50. Bochsler D. Horizontale Zusammenarbeit als Lösung des Problems der Kleinräumigkeit im Schweizer Föderalismus? Eine quantitative Perspektive. In: Auer A, Kübler D, editors. Herausforderung HarmoS - Bildungspolitik, Föderalismus und Demokratie auf dem Prüfstein. Schulthess; 2010. p. 121-46. Bochsler D. Electoral Rules and the Representation of Ethnic Minorities in Post-Communist Democracies (European Yearbook of Minority Issues, 2010). European Yearbook of Minority Issues. 2010;7. Bochsler D. Measuring party nationalisation: A new Gini-based indicator that corrects for the number of units (Electoral Studies, 2010). Electoral Studies. 2010;29. Bochsler D. The nationalisation of post-communist party systems (Europe-Asia Studies). Europe-Asia Studies. 2010;62. Bochsler D. The Marquis de Condorcet goes to Bern (Public Choice, 2010). Public Choice. 2010;144. Bochsler D, Sciarini P. So close but so far: voting propensity and party choice for left‐wing parties. Swiss Political Science Review. 2010;16(3):373-402. While the bulk of the literature focuses on the vote for parties from different blocs, the purpose of our article is to study the vote for two parties that are ideologically very close to each other: The Social Democrats and the Greens in Switzerland. To that end, we develop a two-step model, where voters first make a selection of parties that are acceptable to them and then make their electoral choice out of this set of acceptable alternatives. We use voting propensities as a measure of the first, consideration step and we show that they strongly depend on the distance between voters and parties on the Left–Right scale. With regard to the second, choice stage of the electoral process we hypothesize about the factors that may account for the varying ability of the two parties to convert potential voters into real voters. Our empirical tests provide encouraging support for our hypotheses regarding the impact of socio-demographic variables and issue voting. Strategic considerations, by contrast, do not seem to matter. Bochsler D. Who gains from apparentments under D’Hondt? Electoral Studies. 2010;29(4):617-27. Bochsler D. The nationalisation of post‐communist party systems. Europe-Asia Studies. 2010;62(5):807-27. Party nationalisation, defined as the homogeneity of party strength across a country, has recently become a major issue in research. Even though territory is a salient political question in the post-communist countries in Europe, party nationalisation in these countries has been neglected by the literature so far. This article presents data on party nationalisation for 20 countries over the period 1990–2007. It shows that the nationalisation of party systems in post-communist democracies is closely related to the territorial structure of social divisions, except for cases where the electoral systems provide for a high degree of nationalisation, or where super-presidentialism inhibits the creation of strong nationalised parties. Bochsler D. Electoral Rules and the Representation of Ethnic Minorities in Post‐Communist Democracies. European Yearbook of Minority Issues 2007/8. 2010;7:153-80. Bochsler D. Neka narod odluči? Pouke švicarske direktne demokratije u komparativnoj perspektivi. In: Puls Demokratije. ; 2009. Bochsler D. Die Grünen in der Schweiz. Ihre Politik, ihre Geschichte, ihre Basis by Matthias Baer and Werner Seitz (eds.). Vol 15(2). ; 2009. Bochsler D. Neighbours or friends? When Swiss cantonal governments cooperate with each other (Regional and Federal Studies, 2009). Regional and Federal Studies. 2009;19:349-70. Bochsler D. Let the people decide? Learning from Swiss direct democracy in a comparative perspective. Transitions (special issue, ed. Sylvie Ramel and Francis Cheneval). 2009. Bochsler D. Are Mixed Electoral Systems the Best Choice for Central and Eastern Europe or the Reason for Defective Party Systems. Politics and Policy. 2009;37(4):737-67. Mixed electoral systems have been celebrated enthusiastically in the literature and by political practitioners, arguing that they combine the best of both worlds with regards to several aspects of political representation. This article calls this view into question, arguing that the mixed incentives of mixed electoral systems might hamper the stabilization and institutionalization of party systems in young democracies. Empirical results from 19 democracies in Central and Eastern Europe suggest that the learning and stabilization effect that is exerted through simple electoral systems fails under mixed systems. Using a variance model analysis, this study rejects the common belief that mixed systems lead to more moderate party systems with regards to party system fractionalization. Rather, outcomes under mixed systems vary much more widely than under proportional representation, are associated with higher disproportionality, and tend to increase volatility. Los sistemas electorales mixtos, que combinan sistemas electorales de mayoría con los de representación proporcional (RP), han sido alabados con entusiasmo por la literatura y los políticos, argumentando que combinan lo mejor de ambos mundos con relación a los diversos aspectos de la representación política. Este artículo cuestiona tal punto de vista, señalando que los incentivos contradictorios de los sistemas electorales mixtos podrían dificultar la estabilización e institucionalización de los sistemas de partido en democracias emergentes. Los resultados empíricos de diecinueve democracias en Europa Central y del Este sugieren que el efecto de aprendizaje y de estabilización que es ejercido en los sistemas electorales simples fracasa bajo los sistemas mixtos. Utilizando un análisis de modelos de varianza, este estudio rechaza la creencia común que los sistemas mixtos conducen a un sistema de partidos más moderado en referencia a su grado de fragmentación. En cambio, bajo sistemas mixtos, los resultados varían mucho más extensamente que bajo RP. Más aún, los sistemas mixtos están asociados con una superior desproporcionalidad que en RP y tienden a incrementar la volatilidad. Bochsler D. Neighbours or friends? When Swiss cantonal governments co‐operate with each other. Regional and Federal Studies. 2009;19(3):349-70. Intergovernmental co-operation among Swiss cantons is considered to be much more intensive than in many other federal states. This article investigates different explanations for when and why subnational entities co-operate with each other, and tests them on the Swiss case. In the Swiss case, co-operation seems to be closely connected to the small-scale structure of subnational units. Swiss cantons are fairly small, often smaller than the relevant areas for the provision of public services. This means that cantons need to co-operate with their neighbours and proximate cantons. Further, in the absence of an administrative level that unifies areas with a common language, concordats are a means to co-ordinate policies among German-speaking and French-speaking cantons. The different partisan colours of the cantonal governments only marginally hinder them from co-operating with each other. Bochsler D. Can the Internet Increase. Political Participation? An Analysis of Remote Electronic. Voting's Effect on Turnout, DISC Working Paper. ; 2009. Bochsler D. A QAP Network Analysis of Intergovernmental Cooperation between Swiss Cantons. In: Friemel T, editor. Why Context Matters. Applications of Social Network Analysis. Berlin: Springer; 2008. p. 141-59. Bochsler D. The parliamentary elections in Serbia, 21 January 2007 (Electoral Studies). Electoral Studies. 2008;27:160-5. Bochsler D. The presidential election in Serbia, January-February 2008. Electoral Studies. 2008;27:745-8. Bochsler D. Hawk in Dove’s Clothing: Political Trajectories of Political Parties in Serbia, 2003–2008. Central European Political Studies Review. 2008;10:292-319. Bochsler D. The presidential elections in Serbia, January/February 2008. Electoral Studies. 2008;27(4):745-8. Bochsler D. Resolving the puzzle of party systems in Central and Eastern Europe: the joint impact of party nationalisation and electoral systems. University of Geneva; 2008. Bochsler D. How proportional are mixed compensatory electoral systems? Determining the necessary share of compensation mandates in mixed systems. In: Symposium: Democracy and Its Development. Paper G07-01. Center for the Study of Democracy. Irvine; 2007. Bochsler D. Réforme du fédéralisme suisse: contribution, promesses et limites de la collaboration intercantonale. In: Contributions à l'action publique - Beiträge zum öffentlichen Handeln. Presses polytechniques et universitaires romandes; 2006. p. 267-85. Bochsler D. Ethnic diversity, electoral system constraints and the nationalisation of political parties. A triangle model, applied on the Central and Eastern European countries. CEU Political Science Journal. 2006;1:6-37. Bochsler D, Sciarini P. Konkordate und Regierungskonferenzen. Standbeine des horizontalen Föderalismus. Leges. 2006;2006/1:23-41. Bochsler D, Sciarini P. Neue Indikatoren zur Bestimmung der arithmetischen Regierungskonkordanz (Swiss Political Science Review, 2006). Swiss Political Science Review. 2006;12:105-22. Bochsler D. The 'normalisation' of party systems and voting behaviour in Eastern Europe. Romanian Journal of Political Science. 2005;5:53-74. Bochsler D, Koller C, Sciarini P, Traimond S, Trippolini I. Die Schweizer Kantone unter der Lupe. Behörden – Personal – Finanzen.. Bern: Haupt; 2004. Bochsler D. Schweizer Kantone als Vorbild für Bosnien? Welche Wahlsysteme erleichtern das Regieren multiethnischer Länder?. ; 2003.